The growing epidemic of obesity in the oil-rich Gulf nations is explored in November's 'Inside the Middle East'. Qatar, Bahrain and the UAE may be some of the wealthiest nations in the world, but they have also become some of the most obese. Host Zain Verjee visits Dubai to discover how increasing numbers of Emiratis are turning to stomach stapling surgery to shed their pounds before travelling to Kuwait, where more than 50 percent of the population are overweight. Verjee talks to the Kuwaiti people and learns how fast food, scorching year-round heat and rapid modernisation have all contributed to making this tiny gulf state the second fattest country on Earth. Staying in Kuwait, ‘Inside the Middle East’ heads to the Iraq border where a different, but equally massive, problem is being faced by the fragile desert ecosystem. More than two decades after Saddam Hussein’s retreating troops set fire to Kuwait’s oil fields, following the Gulf War, environmentalists are still trying to pick up the pieces. The programme also meets young Kuwaiti artist Hussain Salameen who is uniquely fusing design and technology to build some of the region’s only chopper motorcycles. In a city like Dubai where radars are almost in every corner, getting an occasional speeding ticket is very common. But a Bangladeshi woman living in the UAE has received more than 250 traffic fines in just 3 months. According to this article in Dubai based, Gulf News, the fines accumulated over the past few months and reached $54,000 most of which were speeding tickets. Traffic violations usually cost between $163 and $272. The police says the record was broken in the past by a Saudi man who had to pay more than $100,000 worth of traffic tickets. In cases like this, the police department cancels the driver's license and the car's registry. Violators are allowed to pay the fines in installments., but so far the woman has not come forward to pay her fines. LOL good old UAE speeding fines, but seriously this is way over the top gulfnews.com/news/gulf/uae/… SLOW DOWN PEOPLE, YOU'LL SAVE LIVES. Dubai Police releases a list of the top 10 traffic violators every six months. The second on the list wasn’t far off behind, a Syrian woman has received 288 fines ranking second with a bill worth just over $50,000. Although two women topped the list, police says men are considered more serious violators than women. The 500 or more radars spread across the city helped reduce the death rate of car accidents. In 2008, 294 people died as a result of car accidents, but the number was lower last year. According to Dubai Police, 134 people died as a result of car accidents in 2011. Police revealed that an approximate of 2.3 million traffic fines are issued per year in Dubai. The list for the second quarter of 2012 showed that out of the ten top violators, five were Emaratis. 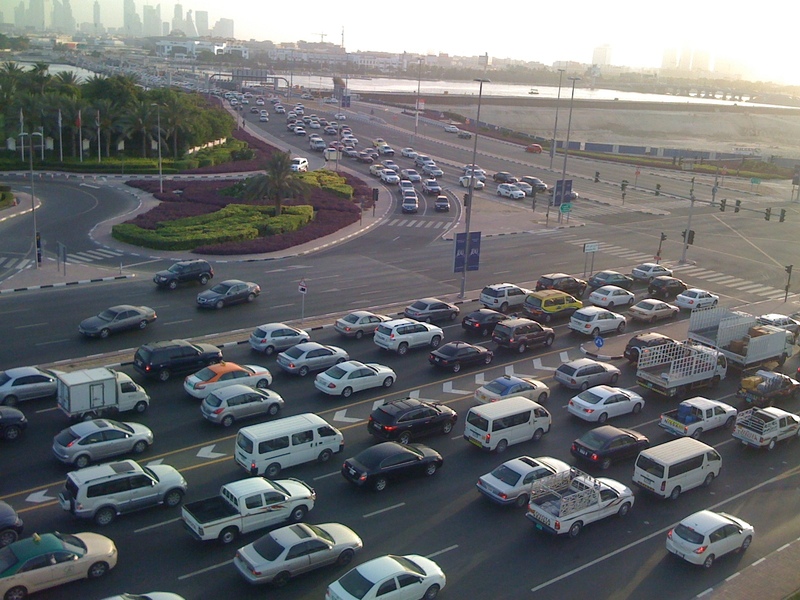 Speeding and not leaving enough space between cars are common violations on the streets in the UAE. In 2008, 200 or so cars crashed into each other in what became one of the biggest car accidents in the history of the UAE. Police at the time said fog and cars driving so close to each other resulted in the crash. Remember the story about the world's most expensive cupcake in Dubai? Bloomsbury’s, a boutique cafe in Dubai, made headlines earlier this year for selling a chocolate cupcake – the 'Golden Phoenix' – for around $27,000. Since the cupcake first made its debut, the store has reportedly only sold two. And now, the shop's owner has said that part of the proceeds on sales will be donated to the United Nations World Food Programme, according to local newspapers in the United Arab Emirates. The creators of the world's most expensive cupcake now say they will donate 50 per cent of the profit from it to the World Food Programme. Ashraf Hamouda, of the World Food Programme, pointed out that the income from a single cupcake could feed at least 1,850 children. He described Bloomsbury's charitable gesture as "formidable generosity". "This unique partnership is evidence that behind the biggest talents and business ideas, you often find the bigger hearts," Hamouda told the National. "As I would put it, a golden heart behind every Golden Phoenix." When it comes to Dubai, it’s not uncommon to hear that the most expensive products in the world are on sale. This year alone, shoppers at a luxurious shopping mall attached to the Burj Khalifa, the world's tallest building, have had the opportunity to purchase gold-plated eyeglasses worth $75,000 and a somewhat more affordable, yet equally ostentatious, $5,500 gold-plated iPad. Neighboring emirate, Abu Dhabi, has long been considered much more fiscally conservative than Dubai. But the UAE's national capital also showed it's propensity for 'bling' in 2010 when the Emirates Palace Hotel (which cost a staggering $3 billion to construct) displayed a Christmas tree worth $11 million. The tree was set up in the hotel lobby, just a few feet away from the world's first gold vending machine. The global financial crisis may have left most of us concentrating on saving money, but in the UAE, appealing to the very high end of the market went out of favor only briefly. From owning multi-million dollar vanity car plates to exotic animals like cheetahs and tigers to using social media to brag about spending tens of thousands of dollars at a restaurant, on the surface, the UAE appears to be an avowedly austerity-free zone. And now, the UAE is home to the world's most expensive cupcake. 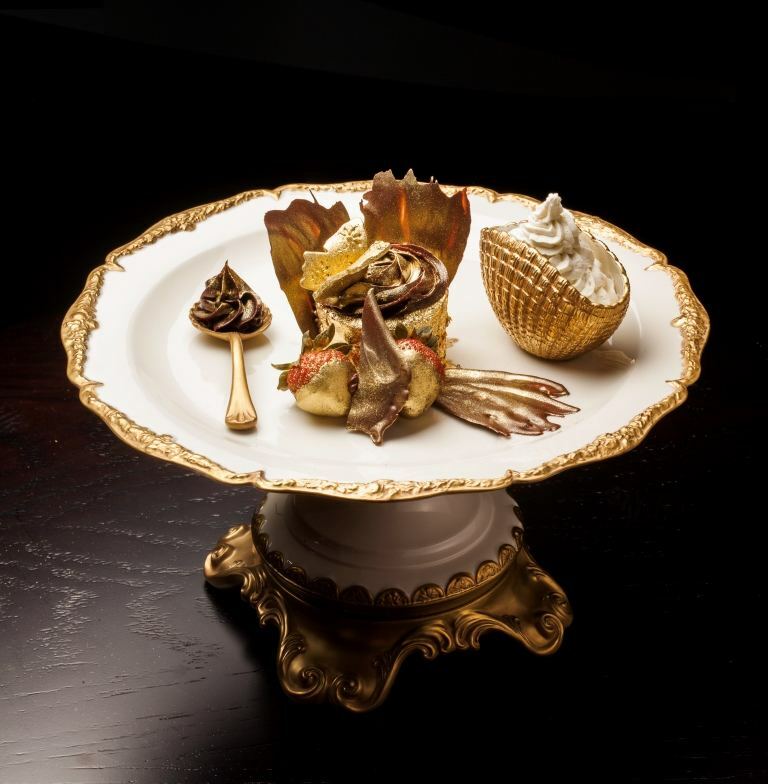 Topped with actual gold flakes, Dubai's latest dish costs more than $27,000. Bloomsbury’s, a boutique cafe in Dubai, calls their latest play for the masses a "work of art." Art that a potential buyer only has a quarter of an hour to admire. But so far there have been no takers. Maybe all the customers are down the road at McDonald's, where the migrant workers – who make up the majority of this country's population – can get a Happy Meal for a meager $2.70. Chocoholics beware! There's a new take on the idea of "getting a chocolate fix." Emirati newspapers Tuesday are flashing alarming headlines like "don't buy chocolate spread in syringes," "chocolate needles alarm bells," and "illegal chocolate syringes spark sharp response." The Dubai Municipality has issued a stern health warning against buying or consuming (or presumably injecting!) chocolate-filled syringes after the photos above were circulated among UAE residents via blackberry, smartphones and social networking sites. The photos show rows of syringes filled with what looks like chocolate, carrying the familiar label of the hazelnut chocolate spread Nutella. Regional distributors of the Nutella brand have issued fervent denials to the press that their product is in any way connected to these syringes and that there is no way they would be marketed or sold to consumers. In a statement released by the municipality yesterday, the head of the food control department at Dubai Municipality said the civic body was working with the Ministry of Health and Ministry of Environment to take necessary action. Some newspapers are reporting similar images dating back a year; but it might have been this online ad in the classified section of a local online shopping site that sparked this recent frenzy. We called the number on the ad and got through to 17-year-old Abu Dhabi resident Salem Al Mihri. He told us that it was indeed him who was selling the candy contraband online. "But what about the Dubai Municipality health warning?" I asked. "What health warning?" Al Mihri asked. He hadn't read today's papers. He claims he came up with the idea a few months ago while hanging out with friends – he considered it an entrepreneurial inspiration. 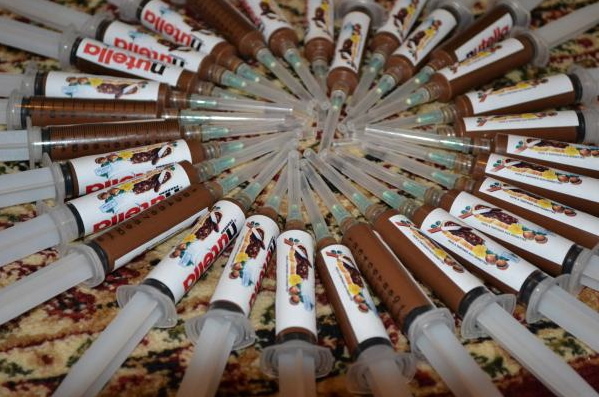 Al Mihri says he bought the syringes from the pharmacy, filled them with Nutella spread and added and label and voila! He says he sold all 30 of his creations to cousins – not the general public . Since our conversation, the photo on the ad has been updated to say "Sold Out." Oh, and he was very insistent that the syringes were totally "sterile" and did NOT have hypodermic needles attached. "It's a fun way to eat them, squeeze them out of the syringe, of course I didn't mean it as an injection!" Al Mihri says he'd like to go to university where he hopes he'll learn to be a businessman and where we hope he'll learn about trademark infringement and food health & safety. The 'Inside the Middle East' team is filming in Jordan this week, preparing for our 101st episode which airs on July 4th. This month, ‘Inside the Middle East’ explores the stories of women throughout the region, highlighting Jordan in particular as a country whose constitution doesn't codify equal gender rights. Host Rima Maktabi heads north of Amman, to a small village along Jordan's border with Syria, to explore the Hashemite Kingdom's notorious 'honour killings'. In the past decade, over 100 Jordanian women have been murdered by their own families. Their crimes? Bringing shame and dishonour on the community, typically for mingling with young men or committing adultery. The programme meets with one woman who fled nine years ago to a shelter, far from her family, to escape threats of death. Maktabi also visits the United Arab Emirates Ewa'a Shelter for Women and Children, where victims are given medical and psychological care. She meets Sara Suhail, an Emirati social worker who has devoted her life to helping victims of sexual violence. The programme also returns to Saudi Arabia to chart the progress of Jeddah United, an all-female basketball team that the programme first met in 2008, as they struggled in a conservative society where women are not allowed to play sports in public. More than 20,000 fans waited in the warm weather for almost two hours before the 'Queen of Pop' Madonna kicked off her concert in Abu Dhabi last week, but her controversial performance is still echoing throughout the region today. Coming from Tel Aviv in Israel, where she debuted her world tour last week, Madonna opened her Abu Dhabi gig with a series of religious, sexual and violent acts that left fans in both countries both mesmerized and shocked. Some Madonna fans in the UAE, according to this columnist from Gulf Newspaper, were upset at the pop star for not abiding by their relatively conservative society. @UAEDressCode - Why is Madonna allowed to dress in mini-skirt with underwear showing in Abu Dhabi! This should be banned by LAW! Madonna opened her first act in Abu Dhabi with religious chants, and featured a huge cross on stage which was later cut in half. In a later scene, Madonna carried an AK-47 and used it – mockingly – to kill a few of the dancers on stage. She then proceeded to strip her clothes, albeit partially, leaving some fans with their jaws dropped in surprise.